Fast Glass Geelong provides professional advice on supply and installation of your dog, cat & pet doors in the Geelong area. Fast Glass Geelong offers a range of top quality dog, cat & pet doors, catering for all breeds, small and large and are even great for rabbits! Our pet doors are safe, strong, durable, and unobtrusive. They come complete with a 4-way locking system and magnetic catch which enables your pet to freely move in and out of your home whilst maintaining security. 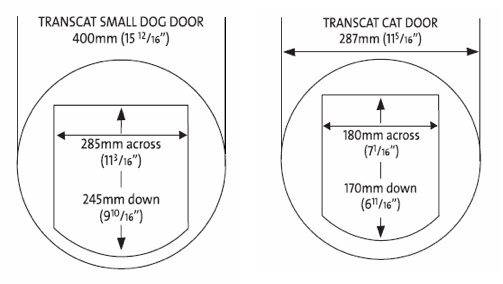 Depending on the size and thickness of glass, dog, cat & pet doors can be installed in existing panels (providing your glass meets Australian Safety Standards). If your pet door is to be installed in a large glass fixed panel or sliding door, Australian safety standards require a whole new panel of glass. Regardless of the glass application, Fast Glass Geelong’s priority is to ensure all glass products comply with or exceed AS1288 Australian Safety Standards. Our experienced glass technicians have installed many dog, cat & pet doors and can advise on the best and safest possible option for your situation. Fast Glass Geelong is proud to serve customers in all areas of Geelong, the Bellarine Peninsula and Surf Coast Shire. From our base in Geelong, we can have a solution for your dog, cat & pet door problem in a timely manner.